Articles, Education Tours, History, Illuminated Tour, Student Travel, Washington D.C.
A trip with your students to the Washington DC area is an adventure they will never forget. The best part of our Washington DC tour is when the sun sets and the entire city is quiet. 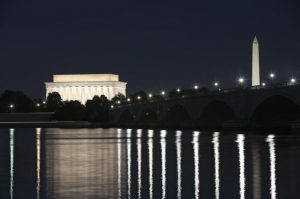 The illuminated tour of the memorials and monuments makes the rich history of Washington DC seem more personal. The tour starts with the tribute to the soldiers of the Vietnam War. The Memorial Wall is etched with 58,318 names. There are 1,200 names that are listed as missing (MIA) from the War never to be heard from again. Another dedication to the Vietnam memorial is the bronze statue of The Three Servicemen which depicts the three troops mourning the deaths of their fellow comrades. The third memorial to the Vietnam War is the Women’s Memorial which shows three nurses aiding a fellow solider and the dedication in their service. Just past the Vietnam Memorial is the Lincoln Memorial which honors the 16th President of the United States. President Lincoln laid the foundation towards ending slavery in the Southern states plus restoring the economy and revamping our government. Walking up the steps of the Lincoln Memorial, reminds you of the famous speech “I Have a Dream” given by the courageous and fearless leader of the Civil Rights Movement, Martin Luther King Jr. one hundred years later. Overlooking the Lincoln Memorial is the Reflecting Pool which has been filmed in several movies where you can relive the scene from the movie “Forest Gump” when Jenny runs in the reflecting pool towards Forest or from “Planet of the Apes” when Captain Leo lands his plane in front of the Lincoln Memorial. From the Lincoln Memorial, you will then find yourself surrounded by the statues of troops from the Korean War depicting the war when North Korea invaded South Korea with the United States came to the aid of South Korea. Sounds eerily familiar to current events. Doesn’t it? The 19 stainless steel statues depict all the branches of the United States military forces which include the Army, Marines, Navy and Air Force. The mural wall adjacent to the statues, is made from granite and portrays the photographs that were captured during the Korean War. The next stop on the tour is the memorial dedicated to Martin Luther King Jr. who was the leader of the Civil Rights movement. He was the voice for the African American community which endured racial discrimination and segregation. Mr. King based his principles of non-violent resistance from Gandhi who was known for his idea of winning “hate with love”. Mr. King continued the work of equality which was started by Abraham Lincoln in giving his famous speech “I Have a Dream” on the steps of the Lincoln Memorial on October 16, 1963. The Stone of Hope at the Martin Luther King Jr Memorial is a portrait of Mr. King carved into a granite statue. Surrounding his statue, is fourteen quotes from either King’s speeches, sermons or writings. Reading each quote displayed on the wall, you can feel the pain and hardship for equal rights during that time period which is still ongoing today. After the Martin Luther King Jr. Memorial, you continue on to the Franklin D. Roosevelt Memorial in honor of our 32nd President. Roosevelt was rated as one of the top US presidents of all time as he guided the government during the Great Depression. He also aided Britain and China against Nazi Germany and Imperial Japan. After the Japanese attacked Pearl Harbor in 1941, he then declared war on Japan and Nazi Germany. He united our country in this dark era. He spearheaded the Social Security Act which provided monetary security for the elderly still in existence today. The Roosevelt Memorial consists of a variety of sculptures to depict his life. There is a statue of Roosevelt along with his dog “Fala”, and another of the first lady Mrs. Roosevelt, honoring her dedication to the United Nations, and another statue of people standing in line for bread to portray the Great Depression. The designers of the Roosevelt Memorial made sure it was accessible to the disabled as President Roosevelt lost his legs due to polio during his childhood. Then it’s a short drive to the next memorial which honors the fallen soldiers of World War II. The World War II Memorial is located between the Lincoln Memorial and Washington Monument. The Memorial is a tribute to the over 400,000 American soldiers who sacrificed their lives during this War. At the center of the memorial is an oval shaped fountain surrounded by 56 pillars representing, at that time, the nation’s 48 states, 7 federal territories and the District of Columbia. The northern entrance arch is engraved with “Atlantic” symbolizing the war against Nazi Germany while the southern entrance arch is engraves with “Pacific” symbolling the war against Japan. The Freedom Wall embellishes 4,048 gold stars, each representing 100 Americans who died in the war. The tallest monument in the district is the Washington Monument which honors our 1st President of the United States, George Washington. Before becoming President, Washington’s leadership secured American independence during the Revolution against Great Britain. His great leadership skills is the reason why he was so popular and elected president. President Washington helped forge the foundation of our nation. He was actively involved with the setup of our federal government that is in use more than 230 years later. Things such as the cabinet system, the inaugural address, plus the term Mr. President. He was also the first to sign the Constitution in 1789. George Washington will always be known as the “father of our country” as he helped the pathway for our country to follow. The illuminated tour will open up your students eyes and bring history alive to them!